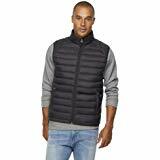 Lightweight Down Alternative Vest Jacket Deal On Amazon! This looks like a warm fluffy vest to keep yourself warm this Fall and Winter! This would also make a great low priced gift for that guy in your life. STYLISH – The Clark puffer vest is stylish and versatile. Wear it over T-shirts, long sleeve shirts, button downs, or sweaters for endless combinations of fashionable ensembles. WARM – A down alternative fill makes this vest ultra-lightweight and comfortably warm. WATER RESISTANT – The nylon shell construction is durable and water resistant to keep you dry and cozy in transitional or cool weather. FUNCTIONAL – The Clark vest features a zip up closure with a high neck, 2 secure front zipper pockets, and 2 large inside slip pockets, making it perfect to wear for an outdoors trip or for your daily routine. EASY CARE AND STORAGE – This puffer vest can be folded into a compact space and easily fits in a suitcase, closet, or drawer for storage. Prices change all the time, so be sure to check your prices before purchasing.